Christians aren’t the only ones who preach. Hollywood does it too, and with great effect. This was no where more clearly seen than in two men who won Oscars at the Academy Awards March 5. 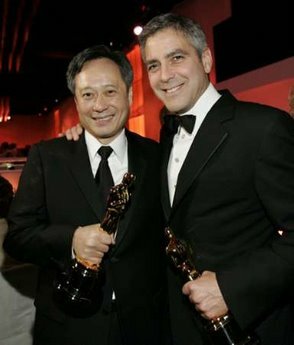 George Clooney and Ang Lee both made a point of saying that movies can and should advocate for causes that the rest of the country may not support. In the acceptance speech after winning the Oscar for best actor, Clooney celebrated the disconnect between his own liberal views and the views of mainstream America. We are a little bit out of touch in Hollywood every once in a while. I think it’s probably a good thing. We’re the ones who talk about AIDS when it was just being whispered, and we talked about civil rights when it wasn’t really popular. And we, you know, we bring up subjects. This Academy, this group of people gave Hattie McDaniel an Oscar in 1939 when blacks were still sitting in the backs of theaters. I’m proud to be a part of this Academy. Proud to be part of this community, and proud to be out of touch. And I thank you so much for this (source). We can all agree with AIDS awareness and the promotion of civil rights. But Clooney implies that current left-wing causes (like the normalization of homosexuality) are morally equivalent to the advent of civil rights for African Americans. Such a position is in fact “out of touch” with the vast majority of Americans (and contrary to the Gospel), but I don’t think it’s anything to be proud of. Clooney is proud to be “out of touch” with mainstream America because he believes Hollywood’s values are superior to those of the “fly-over” states. First of all, I want to thank two people who don’t even exist . . . Their names are Ennis and Jack. And they taught all of us who made ‘Brokeback Mountain‘ so much about not just all the gay men and women whose love is denied by society, but just as important, the greatness of love itself (source). Both Clooney and Lee indicate their intention to advocate in their movies a secularized vision of the world. Make no mistake; they don’t mean merely to reflect culture in their movies, but to shape it. As Christians, it’s important for us to take note of comments such as these. The Gospel of Christianity is one that tells a story that goes from Eden, to the fall, to redemption, to new creation — a story that is summed up and realized through the work of Jesus Christ crucified and raised. Hollywood is telling another story, one that simply will not be compatible with that of the Gospel. To the extent that Hollywood or anyone else tries to impose its stories in place of God’s story (the one true story), we have a sacred obligation to speak up with the Gospel. We don’t need to wait for a Gospel revival in Hollywood to meet this obligation. By God’s grace, let us all resolve to herald the true story whether Hollywood is on board or not. Great points DB. BTW, was I the only one who cheered out loud when Crash got best picture? It is a fine film despite – because of? – its many despicable but all too real characters. In other news, I think stories and thus films are not always so black and white. My wife and I just watched Walk the Line this weekend. What a great film. I’m so glad that Reese Witherspoon got the Oscar. Who’d figure the ditz in Legally Blond could pull that off? I only wish Joaquin Phoenix had as well. His time will come. Again, I really liked Walk the Line (and I really like the music of Johnny Cash). However, in terms of films and “their messages” is there much difference between the immoral/sinful behavior of Johnny Cash with June Carter in constrast to the Brokeback boys? Could we put it this way: One is a perversion WITHIN the created order (man with woman other than his own wife) and the other is an outright perversion OF the created order (man with man)? I’m not one to say that one perversion is better than another. As far as Johnny Cash is concerned, his story ends in redemption–an ending that has been far too underemphasized. But to your point, I agree. I thought “Ray,” one of last year’s big films, was depressing for precisely this reason. The movie depicted a man who treated his wife and other mistresses disgracefully. The movie is a tragedy, and left me feeling disgusted. There was no homosexual perversion there, just the regular heterosexual kind, and I was appalled. In either case, whether it’s “Brokeback” or “Ray,” we have to bring the gospel to bear on the brokenness of our culture. That’s my point. I think the point that clooney was making was that Hollywood has always been the leading edge of liberalism. when civil rights or hiv awareness was liberal, they were pushing it. now, supporting racial segregation or being HIV-phobic (is that almost the same as homophobia?) is disdainfull. seems about right to me. Some movies are supposed to make you feel “disgusted.” Some films, some stories, are tragedies and are designed to make us feel compassion, disgust, pain, etc. Such films depict the human condition, and open up opportunities for commentary on the sinfulness of sin, as well as the hope for redemption that exist outside of that particular story. I guess this is off topic from your actual post.